Google Drive can work offline, but you have to activate the feature first: click the cog icon on the front page of Drive, then choose Settings. On the General tab tick the box marked Sync... offline and Drive begins caching recent Docs, Sheets, Slides and Drawings to your computer. You can’t watch videos or open photos while you’re offline, but you can view, edit and create files in the native Google Drive formats when you don’t have connectivity. 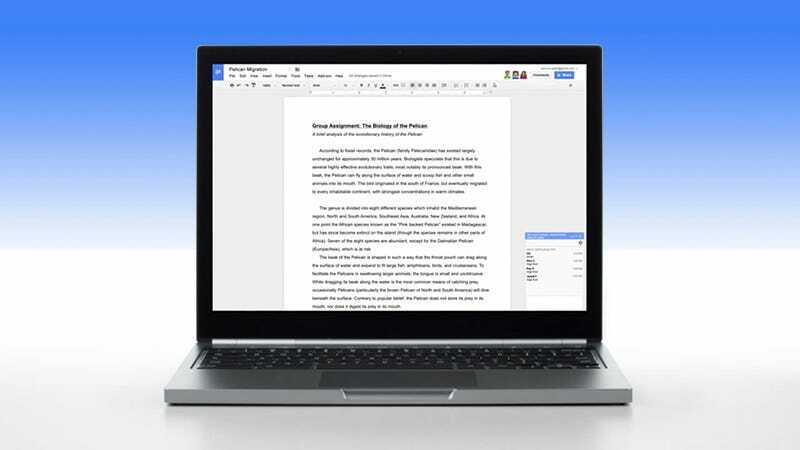 Did you know Google Drive will scan through the text in PDFs and images and make it fully searchable? Just upload a photo of a clearly typed PDF and try it. You can even open up and edit these files too: right-click on a PDF or image, then choose Open with and Google Docs. Depending on the quality of the file and how legible the text is, you might not get perfect results every time, but it’s a useful option to have ready for scanned documents. Google’s pretty good at search and so you would expect there to be plenty of advanced search features available in Drive—click the drop-down arrow next to the search box to see some of them. Use “owner:person@gmail.com” to find documents shared by a certain someone, or “before:yyyy-mm-dd” or “after:yyyy-mm-dd” to restrict your search by date. Add “title:searchterms” to search document titles rather than the whole text of each one. If you’ve installed the Google Drive app for Android then you can use your phone as a portable scanner (the feature hasn’t yet arrived on iOS alas). From the front screen of the app, tap the large plus icon, then choose Scan from the pop-up menu. You can rotate and crop images manually (though the automatic detection works pretty well), plus create multipage documents, and your scans are instantly uploaded to Google Drive as PDFs. Drive keeps older versions of your files just in case you want to go back to them (very handy if you’re working on documents with other people). For a native Drive file, open it and choose File then See revision history; for any other type of file, right-click on it in the document list and pick Manage versions. The pop-up menu to the side of each version lets you download, delete, and permanently keep files past the standard 30-day window. Typing has been around for a long, long time but it’s not the only option for creating documents—you can also dictate them using your voice, and you might find it’s faster for you. Inside a document select Tools, then Voice typing, then click the microphone and you’re away: right-click underlined words to see alternatives if you need to. Various voice commands like “italics”, “go to the end of the line” or “question mark” work as well. Here’s another tip for finding files in your Google Drive account: enlist the help of the Google Now digital assistant to do it. Launch the Google app voice search (note this only works on Android for now) then say “search Drive for” followed by your request—you can only look for specific search terms rather than anything advanced, but it’s a useful option nevertheless. Tap the back arrow (top left) to go to the main Google Drive interface. Looking to free up some space in Google Drive to avoid going over your limit? It’s easy to do—from the front screen of the web app, click the link on the left that tells you how much space you’re using, then click the small Drive entry (or just go straight to this link). The biggest files are at the top and you can click the Quota used heading to see the smallest ones instead (remember native Drive files don’t count towards your storage quota). You’re probably already familiar with adding links to external sites from inside your documents but you can also link between various Google Drive files as well—very handy for research articles and the like. Select Insert then Link as normal, then type out a search term or two to find matching documents from your Google Drive account. If you prefer you can copy the URL at the top of any of your Drive files and paste it into the link field. Install the Google Drive desktop client for Mac or Windows and you get access to all of your files on your local computer too (you can pick and choose which folders get synced). Not only does it make it super simple to upload folders and files (simply copy them into the Drive folder), it also gives you offline access to any of your files you might need on the go—and changes are automatically synced back to the cloud when you get back online.